This rat, which is only found in rainforest habitats, is arboreal and nocturnal in habit. This rat has been observed on campus although these photographs were taken near Kuranda. The characteristic features are the very long tail which is usually longer than the body and head combined, as well as the prominent eyes. 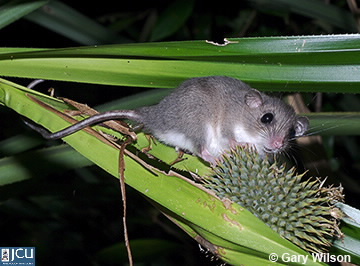 This animal was observed for several nights feeding on the immature fruits of Pandanus monticola.